The northwestern corner of Washington State is dominated by extensive waterways and hundreds of islands. The marine boundary between Washington State and British Columbia runs through the Strait of Juan de Fuca, Haro Strait, and the Straight of Georgia. Puget Sound functions as a marine highway connecting Everett, Olympia, Seattle, Tacoma, and other coastal cities and towns. The state’s coastline is only 157 miles but its shoreline is 3,026 miles. The Columbia River flows through Washington State from British Columbia to Oregon and along more than half of the state’s southern border with Oregon. More than 60 lakes and reservoirs are in Washington with Lake Chelan, Lake Ozette, and Lake Washington being among its largest natural lakes. With its offshore and inland waters, almost 7% of Washington State is covered with water (4,721 square miles). What is Washington’s maritime heritage? Native tribes have lived along Washington’s rivers and coasts for at least 10,300 years, fishing for halibut and salmon, collecting shellfish, and hunting seal and whale in dugout canoes made of cedar. A succession of Euro-American maritime explorers came to the area between 1774 and 1794 to explore and map the coast, the rivers, and the straits. Trappers and traders came to the region in the early part of the 19th century and set up trading posts along the rivers. They were followed by settlers and establishment of an American military presence by the middle of the century when the Washington Territory was formed. Washington has a long tradition of ship-building and maritime trade. The shores of Puget Sound are lined with shipyards built in the 19th and 20th centuries including the Puget Sound Naval Shipyard established in 1891. Steamships and other vessels were used in local and long-distance trade with coastal towns in what are now Alaska, California, Hawaii, Oregon, and Washington. Passenger and freight traffic increased during the California Gold Rush, the Fraser River Gold Rush, and the Klondike Gold Rush, and steamers went to China and Japan to bring immigrants to the Pacific Northwest. The Lake Washington Ship Canal was built in 1906 linking the lake to Puget Sound. In the early 1900s, Puget Sound was known for its “Mosquito Fleet” of hundreds of steamships operated by private transportation companies carrying passengers, freight, and mail on over 40 routes. Today, Puget Sound is served by Washington State Ferries with the nation’s largest ferry fleet. Washington’s offshore waters from the Strait of Juan de Fuca south to the Columbia River Bar are particularly treacherous because of currents, fog, storms, and winds. Although two dozen lighthouses were built along the Pacific Coast and Puget Sound after the Washington Territory was formed in 1853 to help mariners find safe passage, many ships continued to be lost. One such loss is the submarine USS Bugara that served in the Pacific during World War II and the Korean War. Decommissioned in 1970, the Bugara foundered and sank near Cape Flattery while under tow in 1971. 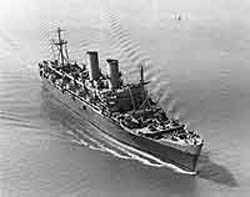 A similar fate befell the troop transport USS General M.C. Meigs that carried thousands of American and Brazilian troops and German prisoners of war during World War II and the Korean War. Placed into the National Defense Reserve Fleet in 1958, the General Meigs ran aground off the coast of Washington in 1972 during a storm while under tow from Olympia to Suisun Bay and broke up over the next four years. The wooden hulled steamships of the 19th and 20th centuries were subject to additional dangers including collisions, explosions, fire, rapids, and snags. The Dix collided with a ship ten times its size, capsizing and sinking off Duwamish Head in Puget Sound. The Mississippi (ex-USS Memphis) was gutted by fire while docked in Seattle. The Camano, the Chelan, the North Star, and the Okanogan burned together while moored at Wenatchee. The St. Paul burned on the Wenatchee Reach. The Alexander Griggs, the W.H. 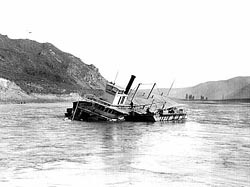 Pringle, and the Selkirk were lost in rapids on the Wenatchee Reach. Who takes care of Washington's underwater archeological sites? The Washington State Department of Archaeology and Historic Preservation has overall responsibility for the state’s historic preservation programs. The Department manages and administers programs aimed at promoting preservation of the state’s historic and cultural sites. The Department maintains an inventory of the state’s historic properties including a registry of historic archeological resources on, in, or under state-owned aquatic lands. The Department advises state and local government officials, property owners, and others on ways to improve site stewardship and heritage education and tourism. If you discover previously unreported historic archeological resources on, in, or under state-owned aquatic lands, you may register it with the Department of Archaeology and Historic Preservation. Registration of such finds gives you a right of first refusal to future excavation and recovery permits granted by the Department for the resources for five years from the date of registration. You need an archeological permit from the Department of Archaeology and Historic Preservation to remove or excavate any submerged historic shipwreck or historic aircraft or to remove any archeological object from such sites. You also need a contract from the Department to salvage state-owned historic shipwrecks or historic aircraft, which includes all such resources abandoned for 30 years or more on, in, or under the surface of any public lands or waters owned by or under the possession, custody, or control of Washington State. What laws concern underwater archeology in Washington? Washington State has enacted several laws calling for the conservation, preservation, and protection of the state’s archeological resources and the dissemination of knowledge gained from the scientific study of the resources. This includes archeological sites on, in, or under submerged and submersible lands and the seabed under the state’s jurisdiction. The state’s laws are found in the Revised Code of Washington. Chapter 27.34 of the Code provides authority for state historical societies and historic preservation. Chapter 27.44 addresses the protection of Indian graves and records. Chapter 27.53 calls for the protection of archeological sites and resources. Chapter 42.56.300 provides an exemption from public disclosure of information about archeological sites. Chapter 43.334 provides authority for the Department of Archaeology and Historic Preservation. Chapter 79.105.600 addresses archeological activities on state-owned aquatic lands. The state’s regulations are found in the Washington Administrative Code. Rules about the advisory council on historic preservation are in Chapter 25-12, rules about registration of historic archeological resources on state-owned aquatic lands are in Chapter 25-46, and rules concerning archeological excavation and removal permits are in Chapter 25-48.